The Road: Begins at US 1 Rockingham (Richmond County) and ends at the Virginia State Line above Stoneville (Rockingham County). Nationally US 220 runs from Rockingham to I-86/NY 17 Waverly, NY. History: US 220 is an original US Highway that didn't reach North Carolina until late 1934 when it was extended south from Cumberland, MD. It replaced US 15/NC 75 from Rockingham to Norman; US 411/NC 70 from Norman to Candor; US 411/NC 70 from Candor to Greensboro; US 411/NC 704 from Greensboro to Madison; US 311/NC 77 from Madison to Virginia. US 311/411 Asheboro to Va. US 220 Asheboro to Va. US 220 originally began at US 1 in central Rockingham and followed then-US 74 Washington St out to present 74 Business westbound. US 220 split north at Ellerbe Rd which it followed to present US 220 which it used toward Ellerbe except for Billy Covington Rd. US 220 then followed today's US 220 Business through Ellerbe, then US 220-A north to Candor. At NC 211, US 220 went west on SR 1579 to loop up over to US 220-A. US 220 then followed 220-A through Biscoe and Star before heading northeast on Gap Rd which becomes "Old US 220" in Randolph County. The route picked up NC 705 back over to Seagrove. US 220 then followed 220-A to the Ulah area where it continued on US 220 Business through Asheboro (except Cedar Grove Rd loop), Randleman, and Level Cross. US 220 then followed Randleman Rd north to the outskirts of Greensboro. In Greensboro, US 220 cut east on O'Connor St from Randleman to Elm, then north to Asheboro St (then US 421), northwest to Edwards Pl west to Greene St north to Price St northeast to N. Elm St north to Wendover Ave west to Winstead Pl west to Northwood St west to Battleground Ave (current US 220). 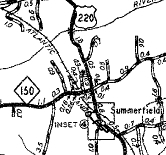 US 220 used Old Battleground Rd, then current 220, then Summerfield Rd through Summerfield. US 220 used Spotswood Rd in the US 158 vicinity. US 220 initially followed Farrar Store Rd, then NC 65 west, Sylvania Rd and NC 68. US 220 followed current 220 north except the SR 1121, 2325, and 1124 loops. US 220 followed US 220 BUsiness through Madison and Mayodan. US 220 continued on Henry St through Stoneville, then the Price Rd segment west of current US 220 before ducking into Virginia at the current crossing. Between 1939-44, US 220 was removed from Old Battleground Rd northwest of Greensboro. Between 1945-49, US 220 was rerouted in Greensboro to stay on Randleman which turns into Ashe St north into central Greensboro (no longer does this, pieces remain as S. Eugene St and Federal Pl. Then US 220 had a wide split routing. US 220 NB turned west on Washington St to N. Euguene St north to Battleground Ave heading northwest. This routing was actually west of the SB routing which used Northwood St east to Wendover Ave east to N. Elm St south to Lindsay St west to Green St south to Spring Garden St west to Ashe to meet back up with NB US 220. About 1952, US 220 was straightened out between Asbury and Seagrove onto present US 220-A, leaving behind Gap Rd/Old US 220 plus an extended NC 705. Between 1950-53, US 220's end was moved to the current US 1-US 74 jct. Washington St became US 74-A for a few years but is now SR 1400. Also between 1950-53, US 220 was removed from Spotswood Rd in the US 158 vicinity, Farrar Store Rd, NC 65, Sylvania Rd and NC 68. Also between 1950-53, US 220 was removed from Price Rd at the Virginia line. Also between 1950-53, US 220 was rerouted in Candor to use N. Main St instead of W. Main St which became NC 211 for a while (now SR 1579). About 1953, US 220 was rebuilt to the east of Summerfield. Between 1954-57, US 220 was removed from the SR 1121, 2325, and 1124 loops north of NC 68. 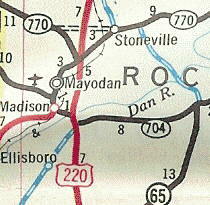 In 1961, US 220 was given its bypass of Madison/Mayodan leaving behind US 220 Business. 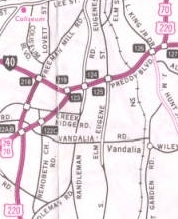 In 1965, US 220 was given its bypass of Stoneville leaving behind some NC 770 and possibly US 220 Business - no official maps show a 220 Business through Stoneville. 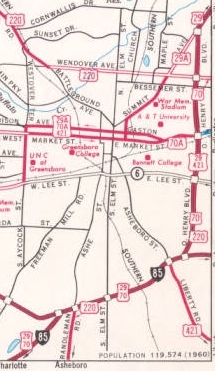 However NCDOT County maps through at least 1980 show a 220 Business. The current county map shows it as SR 1603. Between 1963-68, US 220 was removed from SR 2930 Cedar Grove Rd loop north of Ulah. In 1966, US 220 was given its bypass of Ulah and Asheboro, tying back into the original route at the NC 49A split in Balfour. THe old route became US 220 Business. 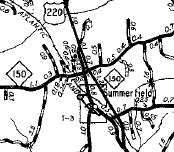 In Oct 1968 (NCDOT), US 220 was removed from central Greensboro by following I-85 (now 85 Business) east then US 29 O'Henry Blvd north to Wendover west to Battleground Rd. It appears this is when US 220 was removed from Northwood Rd/Winstead Pl. 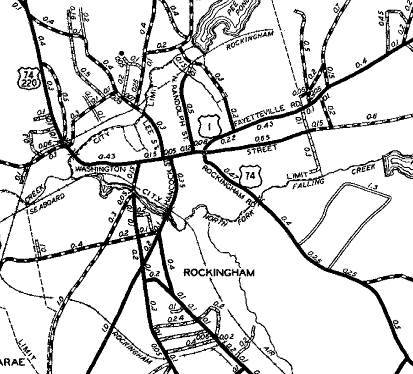 In 1970, US 220 was rerouted in Rockingham to its current configuration via new construction, leaving behind SR 1335 Ellerbe Rd and some US 74 (now 74 Business); also US 220 was removed from SR 1336 Billy Covington Rd. 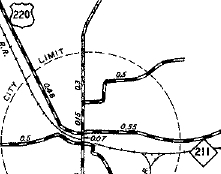 In Nov 1972 (NCDOT), the US 220 bypass of Asheboro was extended north to US 311. US 220 then replaced US 311 east back to the original route. The NCDOT approval document stated that US 220 Business cut west to US 220 at Balfour and that US 220 from Balfours to US 311 was downgraded to a secondary route (by 1974 it was part of US 220 Business). In 1974, US 220 bypassed Randleman, cutting back to the original route at Level Cross. This left behind a bit of US 311 and more US 220 BUsiness. 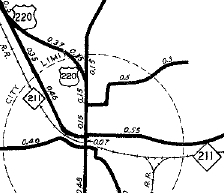 In 1979, US 220 was placed on new freeway bypassing Candor, Biscoe, and Star. The old route became US 220 ALT. 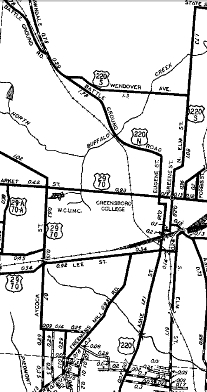 In 1982, US 220 was placed on new freeway from Level Cross to Greensboro. 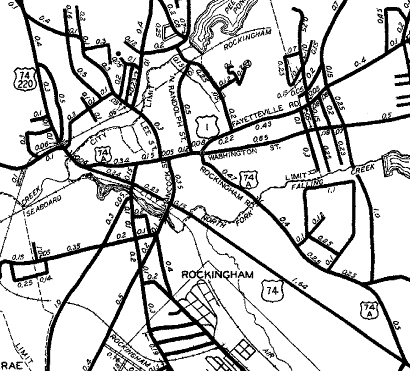 The US 220 piece east to Level Cross became the northernmost part of US 220 Business while Randleman Rd north to became Randolph/Guilford SR 1007. In 1996, US 220 was extended north of then-I-85 to I-40 then east back to I-85. In 1997, US 220 was placed on new freeway that connected the Asheboro Bypass to the Candor/Biscoe freeway segement. This was a bypass of Seagrove and left behind an extended US 220-A. In 2008, US 220 was placed on new freeway from Candor to south of Ellerbe, leaving behind US 220 Business. In early 2014, US 220 was restored through ellerbe, replacing US 220 Business. Comments: US 220 is full freeway from south of Candor to northern Greensboro. North of Greensboro it is in much of the path of upcoming I-73. My hunch is that when the freeway is extended south and west of Rockingham to I-74/US 74, US 220 will remain on its current routing down to US 1. Coupled with US 29, US 220 makes a pretty direct alternative from Washington DC to Florence, SC and points on I-95 further south (using either US 1 and US 52 or US 74 and NC/SC 38). I always thought it would be good to extend US 220 down to SC 9 and then east to the Myrtle Beach area.